Although there are many great writers and directors working in cinema today, few have voices as distinct and pleasurable as Wes Anderson’s. With films ranging from “Bottle Rocket” (1996) to “Moonrise Kingdom” (2012), Anderson has introduced moviegoers to unusual worlds, fantastical characters and bizarre settings that entertain while provoking thought. He is a manufacturer of fairy tales for our modern age and, as such, his projects should be widely celebrated. 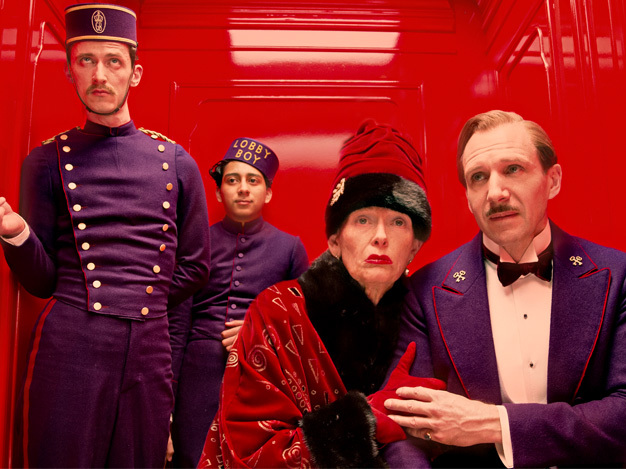 With “The Grand Budapest Hotel,” Anderson delivers another curious tale and, as usual, the movie’s narrative is as creative as the story itself. Anderson tells his story in layers, leaving viewers to interpret point of view. The film begins with a young woman visiting the grave of a famous author who is never named. As she sits down to read his book, “The Grand Budapest Hotel,” his narrative voice takes over, and we meet him both as an older man (Tom Wilkinson) and a young buck (Jude Law). The book then plays out on screen, taking us to a past date when the young writer visited the Grand Budapest, a once-luxurious venue that had fallen into disrepair. During his stay, he was fortunate enough to meet Zero Moustafa (F. Murray Abraham), the wealthy owner of the facility. They dine together and Zero tells the writer how he came to own the once-fine establishment. This kicks off yet another narrative voice, so viewers are watching a movie that cleverly merges multiple perspectives. In what one might call the main storyline, Zero transports viewers to his youth, when he was a lobby boy in the hotel. At that time, the facility was one of the finest in the fictional, European country of Zubrowka. Although young Zero (Tony Revolori) has no experience in the hospitality business, the hotel’s excellent concierge, M. Gustave (Ralph Fiennes), takes him under his wing. In short order, Gustave has transformed Zero into both a competent hotel employee and a confidante, and the two share a great adventure. All stems from the fact that Gustave, who makes a practice of sleeping with elderly, female hotel guests, inherits a priceless painting from one of his “clients.” This goes over poorly with the woman’s heirs, and when it is discovered that the woman was murdered, things get seriously convoluted. Anderson and co-writer Hugo Guinness, who based their screenplay on the works of Austrian writer Stefan Zweig, deliver a fantastical tale of murder, intrigue and sentimentality. Although the setting is fictionalized, it bares a strong resemblance to 1930s Austria, with Nazi-like war references throughout. Many of the things depicted on screen could never happen, meaning similarities to actual events are included more for comic value and perspective than social commentary. Nevertheless, the touchstone is appreciated. Anderson’s film is a meditation on the values of our collective past … and a fine one at that. It plays not only with narrative but with more technical aspects of the filmmaking process, including the mixing of color and black-and-white cinematography and frequently shifting aspect ratios. Anderson also uses snippets of stop-motion animation to give the picture a wonderful sense of whimsy. Everything from the art direction to the costuming is gorgeous, and every element works together to sweep viewers into the director’s fantasy world. Of course, Anderson gets significant help from his cast. Fiennes, Wilkinson, Law, Abraham and Revolori are fabulous, and they are joined by an impressive group of supporting players, including Adrian Brody, Bill Murray, Willem Dafoe, Jeff Goldblum, Harvey Keitel, Edward Norton, Saoirse Ronan, Jason Schwartzman and Owen Wilson. Most of these actors are Anderson regulars, and they have no trouble contributing to the project’s unique and wonderful vision. Blu-ray and DVD extras include a stills gallery and numerous making-of features. While the idea of a big-budget, feature-length movie inspired by building blocks seems odd, fans know that Lego has become more than a manufacturer of plastic bricks. The company has long been a player in the video game market, and it has produced a number of successful, direct-to-video films, all while maintaining a reputation for extreme creativity. “The Lego Movie” is the company’s most noteworthy media project, and it mostly succeeds. The story is centered in a universe populated by sentient Lego minifigures. Because the toy company has extensive licensing deals, the story includes appearances by Lego-ized versions of characters from a variety of familiar franchises, including “Harry Potter,” “Lord of the Rings” and “Star Wars.” Several D.C. Comics superheroes, most notably Batman, also play a role in the plotting. The hero, however, is a commonplace minifigure named Emmet Brickowski. Emmet, who is a construction worker by trade, has always lived his life by the rules. He loves the same TV show as everyone else, he rocks out to the same popular tune and he feels lost without an instruction manual. That makes him a stark contrast to his world’s master builders. These construction whizzes can assemble everything from spaceships to buildings in seconds, and they have no use for instructions. It therefore takes everyone by surprise when Emmet discovers the mysterious Piece of Resistance, thereby fulfilling a prophecy that he will become one of the Lego universe’s great heroes. Conveniently, his discovery comes just as the evil Lord Business is about to unleash a plot that will destroy life as the minifigures know it. The plotting is straightforward and directors Phil Lord and Christopher Miller (“Cloudy With a Chance of Meatballs,” “21 Jump Street”) use the story as an excuse to introduce goofy, good-natured gags, most of which are solid. This, along with terrific computer animation, make the movie a pleasant and entertaining distraction. It also features a first-rate voice cast, including Will Arnett, Elizabeth Banks, Morgan Freeman, Jonah Hill, Chris Pratt, Channing Tatum and Will Ferrell (who also makes a live-action appearance). Unfortunately, the lightweight plotting eventually undermines the feature, making it feel long, even though it barely cracks the 100-minute mark. Also, the 3D elements add nothing to the film, making the Blu-ray 3D an unnecessary upsell. These flaws aren’t so pronounced as to ruin the project, but they prevent “The Lego Movie” from entering the top tier of animated pictures. Blu-ray and DVD extras include outtakes, deleted scenes, behind-the-scenes features, fan-made films and an audio commentary. There was a point when Nicolas Cage seemed destined to lose the edge that made him great. Bland commercial projects, like “National Treasure,” “Ghost Rider” and “Season of the Witch,” dominated his filmography, and his great performances were sporadic. Thankfully, Cage never abandoned his art, and he left us a few gems (“Adaptation,” “World Trade Center,” “Bad Lieutenant: Port of Call New Orleans”) even during the lean years. With “Joe,” Cage seems to be making the point that no matter how commercial he becomes, he’ll always make room for the unusual roles that made him a star in the first place. In the film, Cage plays Joe Ransom, a former convict trying to stay on the right side of the law despite bad circumstances and his own violent nature. Cage and director David Gordon Green make it clear that Joe is a good man in a bad situation, and that makes him an engaging and likable presence. This is particularly true when Gary (Tye Sheridan), a teen boy, asks if he can join the crew of laborers that Joe is managing. Sensing that Gary is in need, Joe signs him up and introduces him to the rest of his roughneck crew. Their job is to poison trees so a lumber company can clear and replant the area. Although the work is sketchy, Gary is just happy to make some cash, and the fact that Joe cares about him is a welcome change. The boy isn’t so lucky at home because his mother is uninvolved and his father (the recently deceased Gary Poulter) is an abusive alcoholic. As the story of Joe’s relationship with Gary plays out, Green gives viewers a look at other aspects of the man’s life, none of which are pleasant. Joe is a regular at a seedy brothel, he has an ongoing feud with a local lowlife and law enforcement is always nudging him to stay in line. In this dark existence, Gary is a bright spot, and Joe becomes one of the young man’s fiercest allies, giving him not only a job but the tools to stand up against the cruelties of the world. Green has had an unusual directorial career, moving from the highly acclaimed dramas “George Washington” and “All the Real Girls” to the ill-conceived, low-brow comedies “Pineapple Express,” “Your Highness” and “The Sitter.” “Joe” is his best work in years, and it is a reminder that he – like Cage – is capable of great things. Blu-ray and DVD extras include two making-of features, deleted scenes and an audio commentary. “Ernest & Celestine”: This French-Belgian movie received an Oscar nomination for best animated feature film at the most recent Academy Awards ceremony. Based on the children’s books of Gabrielle Vincent, the film focuses on a mouse who forms an unlikely friendship with one of her kind’s natural enemies: a bear. The home video release has an English-language dub featuring the voices of Paul Giamatti, Forest Whitaker, Lauren Bacall, William H. Macy and Jeffrey Wright. The original, French soundtrack is available as a bonus. “Walk of Shame”: Comedy starring Elizabeth Banks as a television reporter who may lose out on the job of her dreams when a one-night stand leaves her stranded in downtown L.A. James Marsden also stars. Written and directed by Steven Brill. “House of Cards” – The Complete Second Season: Netflix is changing the way people watch TV by producing its own series and releasing multiple episodes simultaneously. “House of Cards,” a political drama about a ruthless democratic Congressman (Kevin Spacey), was the company’s first big TV success. This video release makes it possible for folks who don’t subscribe to Netflix to check out the acclaimed drama. Robin Wright, Kate Mara and Corey Stoll also star. “Picnic at Hanging Rock”: Director Peter Weir’s critically lauded, 1975 drama about a group of schoolgirls who disappear during a class picnic gets the deluxe treatment from the Criterion Collection. The movie features a remastered, high-definition digital transfer and a 5.1 soundtrack. Criterion’s release also includes Blu-ray and DVD versions of the film and a copy of the Joan Lindsay novel that inspired it. “Regular Show” – The Complete Third Season: This release contains 39 episodes of the animated show about the surreal adventures of two friends – a blue jay and a raccoon. The series has been an ongoing hit for Cartoon Network, and it is currently in its fifth season. “Judex”: Reissue of director Georges Franju’s 1963 crime film that begins with the kidnapping of a corrupt banker. Channing Pollock stars. Presented in French with English subtitles. “Hearts and Minds”: The Criterion Collection delivers a restored transfer of director Peter Davis’ 1974 documentary about America’s involvement in the Vietnam War. The movie won the Oscar for best documentary feature in 1975. “This is America Charlie Brown”: With Independence Day drawing near, Warner Brothers is rolling out this collection of eight Peanuts TV specials with patriotic themes. Included are “The Mayflower Voyagers,” “The Birth of the Constitution,” “The Building of the Transcontinental Railroad” and five more. The Angela Mao Ying Collection: Fans of martial arts movies should appreciate this Shout Factory release containing six movies with Angela Mao Ying. The included titles are “When Taekwondo Strikes” (1973), “The Tournament” (1974), “Stoner” (1974), “The Himalayan” (1976), “A Queen’s Ransom” (1976) and “Broken Oath” (1977). “No Clue”: Comedy about an advertising salesman (Leo Falloon) who poses as a private detective when a beautiful woman (Amy Smart) mistakenly comes to him in order to locate her missing brother. David Koechner also stars. Directed by Carl Bessai. “The Good Witch’s Gift”: In this third entry in the Hallmark Channel’s “Good Witch” series, Cassandra (Catherine Bell) prepares to wed her beloved, Jake (Chris Potter), but a mystery from his past threatens their happiness. I’m shocked you thought Lego Movie was ‘lightweight plotting’. I was really moved by the big surprise in the third act (don’t want to give it away). I thought it was so moving the idea of a child trying to explain his world to his Dad. But then it was still so funny and I thought nearly every joke worked. I felt like it zipped along and I liked the 3D. More for adding texture than things jumping at your face. I felt like it clipped along so well and I’m someone who can have a short attention span. I wish my nieces lived by me so I could take them to the Lego movie. Oh and great blu-ray packaging. So fun. Interesting. I didn’t find the plotting particularly deep or unique, although that’s a fair critique of nearly every animated film. Of course, I also didn’t see it as the blatant condemnation of capitalism that some people did. I’m a little surprised it is as popular as it is. I think it’s a good film, but I’ve watched it twice and I still don’t see the brilliance that some people do. Yeah I was dazzled. To me it was like Toy Story movies. Funny, bright, cheerful but with real heart. Of course, most years it’s the children’s movies that are my favorites. When they are bad they are really bad (Smurfs) but when they are good I love them. What I also liked is the plot was set up like a kid actually plays. When you watch a kid play they have cowboys and dinosaurs and star wars all jumbled up. I loved that. But yeah nothing wrong with enjoying something but not being in love with it. The well-made children’s movies are usually among my favorites, too. For some reason this one didn’t reach the top tier for me. But, as you noted, I did enjoy it. No question that it’s a good film. There are some really clever jokes in it.